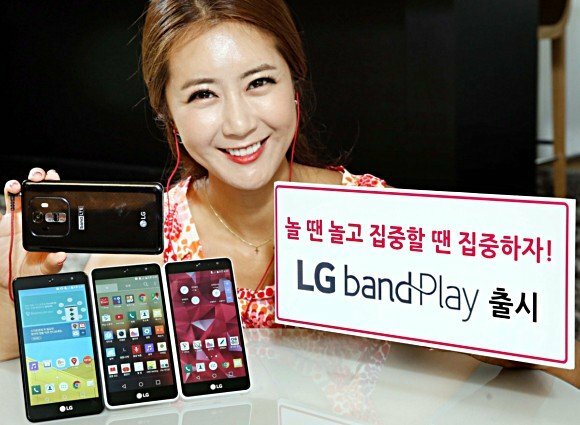 LG posted to their Korean newsroom information about the LG Band Play. This mid–range device wants to be a multimedia powerhouse without the power. The LG Band Play runs on a quad-core Qualcomm Snapdragon 410 processor clocked at 1.2GHz. The Band Play also packs 2 GB of RAM, 16 GB of storage (expandable via microSD), and a 5 inch screen with a 720p resolution (720 x 1280). All of this is powered by a removable 2,300 mAh battery. The specs clearly aren’t the thing that makes this device interesting. We mentioned that it is geared towards multimedia. You might be wondering “How do you achieve that with those lackluster screen specs?”. I know I sure was when I first heard of this device. The magic is hidden in the sound system. LG boasts a 1W high powered speaker with enhanced bass which is supposed to deliver loud, rich sound. This was also highlighted as a key feature of the LG G3. Not only are the speakers supposed to be top notch, LG also is shipping the Band Play with a pair of premium QuadBeat 3s. The earbuds that you can see this nice lady wearing. The Band Play will be running Android 5.1 out of the box. In addition to LG’s rendition of Android 5.1, the Band Play will also have a focus mode. This focus mode is designed to make sure that you stay productive. To achieve this, your phone will be silenced, cellular connection and Wi-Fi will be shut off, and any inbound calls will be automatically declined with a rejection message. On top of limiting distractions, your LG Band Play will also play music similar to therapy music that will help you stay focused. To me, this sounds more production focused then play focused which is in the name. I personally think it should have been called the “LG Band Work”, but maybe that is just me. The other notable feature on the LG Band Play is it’s camera. The rear facing camera is a 13 megapixel shooter equipped with laser auto-focus and a wide angle lens. On the front is a standard five megapixel camera for your glorious selfies. The price is set at 394,800 KRW or about 355 USD, and will be available in South Korea in two colors, black and white. There is no hints to an international launch as of right now. Translations of the LG post were done by Pocket Now, GSM Arena, and trusty old Google Translate.